There is nothing like having the right tool for the job to make life easy. I must confess that I love quality fishing accessories – knives, torches and fishing pliers – that kind of thing. I own about three Leatherman multitools which have superseded my Swiss army knives. About 25 years ago, following decades of frustration and split thumb nails, I discovered the joys split-ring pliers. The first ones I owned were pressed-steel rudimentary junk that rusted badly, but even they were a revelation. Jump forward a couple of decades. A year or so ago the Black Magic Tackle Company introduced revolutionary split-ring pliers that pushed split-rings apart, rather than wedging them open. These won the ‘Best Fishing Accessory’ award at the Australian Fishing Trade Association Show in 2009 and were ideal for the large diameter super-strong split-rings that are used with long jigs and assist hooks for kingfish and other large critters. It is nice not to have too much gear hanging off your belt or cluttering up the tackle box so Black Magic could see the need to compliment their award-winner with a well-made pair of compact multi-purpose fishing pliers for the average fisho, suited to a range of general tasks. Enter the Black Magic Compact Fishing Pliers. Slightly smaller than their brother, they feature the same tough anodised finish (available in three colours: blue, red and gun-smoke), replaceable tungsten-carbide cutters and replaceable hardened-stainless jaws. These jaws feature a hooked tip and a wedge further back, offering two options for opening split-rings of pretty much all sizes. A ridged section near the front of the jaws offers a good grip for removing small to medium-sized hooks, while further back a flat section is useful for tightening knots. 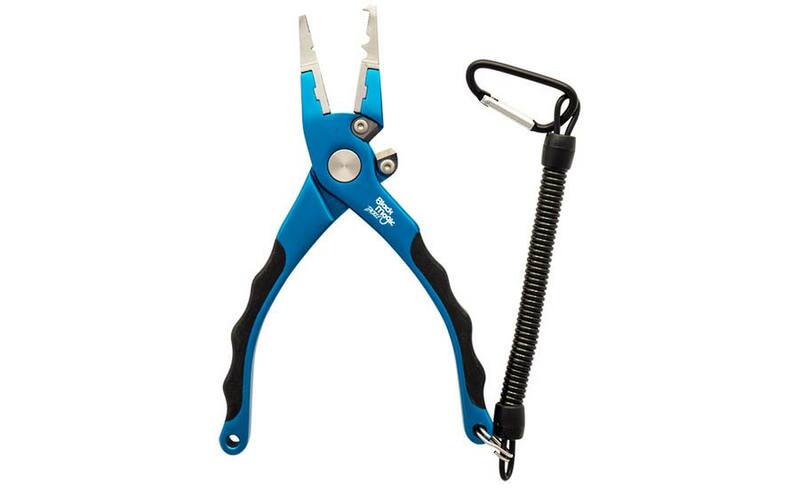 The pliers are supplied in a ripstop nylon pouch with Velcro strap to hold the pliers in place, a belt loop and a stretchy lanyard to save them from being dropped over the side. Stops your mates nicking them all the time, too. I have been using a pair for general fishing tasks since last summer and find that they fill a wide range of requirements well, meaning I only have to carry one tool with me. Besides dealing with split-rings when changing hooks on jigs, minnows, poppers and so on, I find the cutters brilliant. The tolerances are so good and the blades so sharp that they snip through even very fine braid lines with a satisfying ‘snick’; and mono likewise, making rigging easy with both materials. To preserve this excellent cutting edge I don’t use them on wire, and if unhooking fish with them make sure I keep the hook to the front of the jaws, away from the cutters. Should I be going on a trip where I might be trying to wrench a big circle hook from a ‘puka or other heavy task, I take heavier tools. Rinse the salt out of the pouch from time-to-time and give them a regular spray with lubricant and you will probably be leaving them to your kids. They look really cool too, but this is more than just fishing ‘bling’; it is good quality gear ‑ light and strong, useful and practical, and worth looking after. Front-line tackle.